Hickory wood is a perennial favorite of elite BBQ cookers from Missouri to Texas and all through the South. Hickory is famous for smoking pulled pork, hams, bacon and ribs. If you want classic smoke flavor that's been tried and true over the ages, stick with Hickory and you'll be smoking like a pro. Hickory wood is a perennial favorite of elite BBQ cookers from Missouri to Texas and all through the South. Hickory is famous for smoking pulled pork, hams, bacon and ribs. If you want classic smoke flavor that&apos;s been tried and true over the ages, stick with Hickory and you&apos;ll be smoking like a pro. Hickory also works great in combination with a neutral wood like alder or fruit wood like apple or cherry. 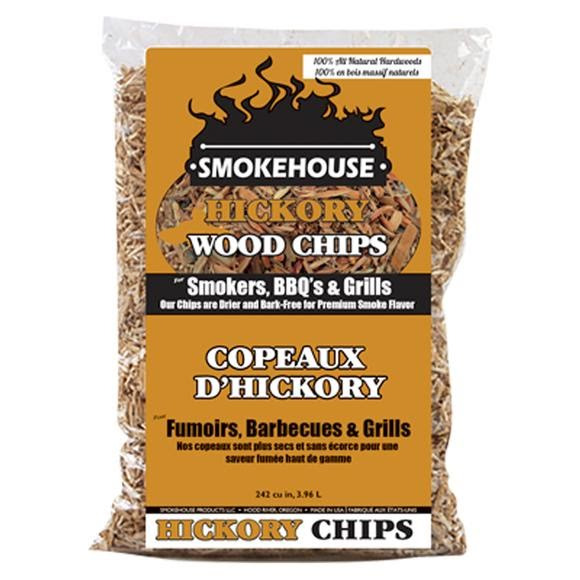 Start smoking like a pro with our Hickory Wood Chips/Chunks! All of our wood is thoroughly dried and has all bitter tree bark removed to ensure you&apos;re getting maximum smoke of 100% all-natural wood. The wood chips are precision ground for an even, consistent burn. The wood chunks are BIGGER, CHUNKIER, pieces of wood perfect for grilling and barbecuing. The wood chunks are perfect for use in our Gas Smoker Cooker and Wide Gas Smoker Cooker. All bags are 1.75 lb bags, 242 cu.in., 3.96 L in size.